Rentwear recently concluded its campaign to aid breast cancer patients, raising $8,000 from local businesses. That’s roughly quadruple the amount that the organizers of this North Canton, OH, textile service company had anticipated when they launched their fundraiser in August. The funds will be split, with $5,000 going to the Josette Beddell Memorial Foundation and $3,000 going to a local breast cancer patient, Christine Boron, to help her manage expenses. The money was raised through the sale and rental of “Stomp Out Breast Cancer” floor mats, the sale of pink Rentwear golf shirts and donations from area businesses, such as Impulse Training in North Canton. 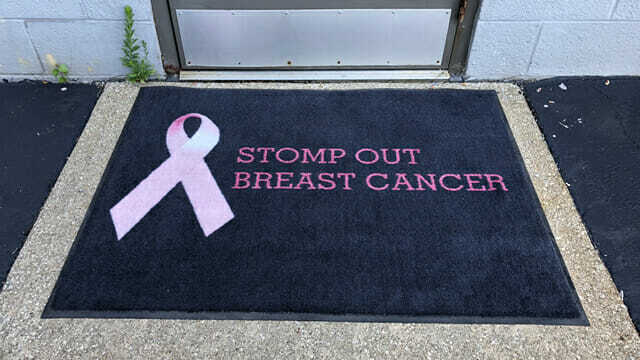 The fall campaign also featured a social media scavenger hunt where community members and businesses were encouraged to post pictures of Stomp Out Breast Cancer mats to raise more funds for the Foundation. The promotions resulting from mat photos were shared 80 times on Facebook and Instagram. Beyond supporting a worthy cause, the organizers got a kick out of the campaign and the enthusiastic response it generated. The Josette Beddell Memorial Foundation team are pleased as well. They’ll use the funds to continue giving financial grants to Ohio breast cancer patients. “We are so thankful for Rentwear’s Stomp out Breast Cancer campaign,” said Mary Beddell, president of the Foundation. “It was great to see a local business partner with a local nonprofit do so much good in northeast Ohio.” Click here to learn more.